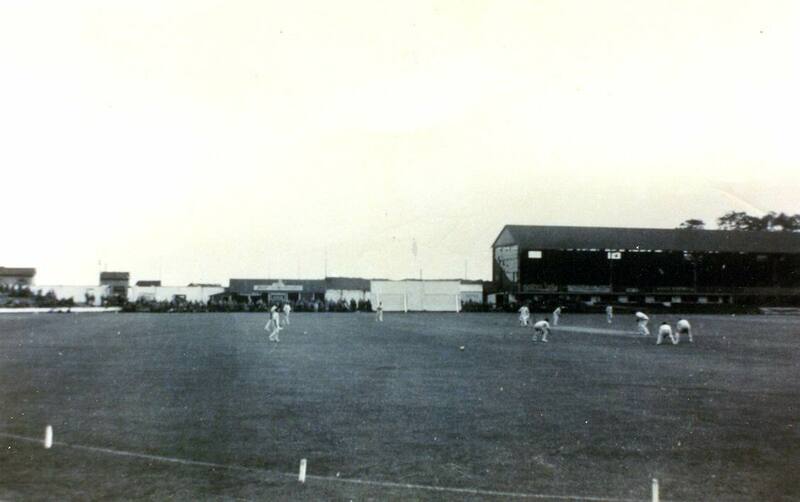 The St.Helen’s ground in Swansea has staged first-class cricket ever since Glamorgan joined the County Championship in 1921. The ground, which overlooks Swansea Bay, is laid out on a reclaimed sandbank, and with its sandy subsoil, St. Helen’s is considered to be one of the fastest drying grounds on the Championship circuit. However, the downside of this maritime location is that the wicket can have a fickle character, especially when the tide is in, with the underground moisture aiding swing bowlers. In fact, a number of Glamorgan captains have hastily checked the local tidetables before going out to toss up! Over the years, some of Glamorgan’s most famous victories have taken place at Swansea including the memorable win over the South Africans in 1951 in front of 24,000 excited spectators – Glamorgan’s Jim McConnon taking a hat-trick and the tourists bowled out for only 83 in their second innings. It was at St. Helen’s, too, that Glamorgan recorded back-to-back victories over Australia in 1964 and 1968. (The 1964 victory was only the second win over an Australian touring side by a county since 1912.) It was also the ground where, in 1968, Sir Garfield Sobers of Nottinghamshire and the West Indies, became the first player in cricket history to hit six sixes in an over. And it was where Clive Lloyd scored the fastest double-century on record when batting for the West Indians against Glamorgan in 1976. Swansea was also the ground where, in August 1985, Matthew Maynard launched his county career with a remarkable debut hundred as he reached his maiden first-class century with three successive towering straight sixes off Yorkshire’s Phil Carrick. Matthew then returned up the 70-odd steps of the pavilion to a standing ovation – somewhat different to the unfortunate fate that befell Mick Norman of Northamptonshire who bagged a king pair in a day at St. Helen’s in June 1964. Twice within a few hours he had to make the long walk back up to the Swansea pavilion after being dismissed first ball of both innings! The St. Helen’s ground has been the home of Swansea Cricket and Football Club since the mid-1870s, with its creation following a search by the Club for a permanent home, having previously played on Crumlin Burrows, the Bryn-y-Mor Field and other locations on the western outskirts of the town. The ground takes its name from a convent dedicated to Saint Helen that was built by an order of Augustinian Nuns on the foreshore of Swansea Bay during the Medieval Period. During the 16th century, the land and the convent passed to the Herbert family, who in turn sold it to Colonel Llewellyn Morgan, who in 1872 agreed to the sandbanks being levelled to create a recreation ground. The first games of cricket had taken place at St. Helen’s during the mid-19th century in a field near Gorse Lane as the town’s cricketers led a peripatetic existence around the town searching for a new base. Indeed, the field near St. Helen’s was used in 1866 for an exhibition match between a XXII of Swansea against the United All England Eleven in an attempt to raise money for the purchase of a field where a permanent home could be created. A lifeline came the following year when Robert Eaton offered them the use of Bryn-y-Mor Field, but it suffered from poor drainage, with many occasions in the late spring and early summer when the outfield was in a damp state – hardly, the sort of venue for a club considered to be one of the leading teams in South Wales. Nevertheless, the young gentlemen of the Swansea area so much enjoyed their sporting camaraderie on the cricket field that in 1872 they formed a football team – in fact, many cricket clubs in Wales at that time branched out into winter sports, playing either football or rugby. But there was still a problem with drainage, and there were several occasions in the 1870s when both matches were transferred to the rougher wickets on the foreshore of Swansea Bay. Around this time, the Club also used Primrose Field – a recreation ground in a more central location of the town which subsequently became the headquarters of Swansea’s Working Men’s Club. But this was also far from ideal for either cricket or rugby as it had a pronounced slope. There must have been several sighs of relief when negotiations began during 1872 to create a level, purpose-built and freely-drained ground at St. Helen’s which could be used by the town’s leading sportsmen for their ball games during the summer and the winter months. One of the men behind the acquisition of St. Helen’s was J.T.D. Llewelyn, the influential squire of Penllergaer and a leading member of both the South Wales Cricket Club and the Glamorganshire county side, who he had helped to form in March 1868. The Old Etonian and Oxford-educated industrialist had a wide range of sporting and political contacts in South Wales and London, and he was keen to promote healthy recreation in the Swansea area. Indeed, it must have deeply hurt J.T.D. when the M.C.C. dropped their fixture with the Swansea Club owing to the poor state of the wicket. In 1872 J.T.D. and several other leading Club members made an approach was made to Colonel Llewellyn Morgan who owned the land and sandbanks lining the foreshore. With existing land in the town being swallowed by urban sprawl, the ambitious plan for St. Helen’s involved creating new land by reclaiming the sandbanks. The negotiations with Colonel Morgan went well, and by the end of the year, an agreement was reached for the creation of a new sports field – at a cost of £2,000 – adjacent to the Oystermouth Road. In the Spring of 1873, the sandbanks were levelled, turfed and rolled, and during the summer months, Swansea C.C. played their first games at their new and permanent home. 1874 saw the final matches at Bryn-y-Mor Field, as the Swansea club focussed their activities at St. Helen’s. The grand opening of the new ground took place on Whit Monday 1875, and with cricket still the major sport, the new sports field was frequently referred to, during the course of the next few years, as ‘The New Cricket Field, St. Helen’s.’ However, the rugby section was not forgotten, with J.T.D. Llewelyn continuing to give his support to the club, by helping to finance the building of a pavilion and dressing room to serve both the summer and winter games. Another person behind the success of the St. Helen’s ground was William Bancroft – the patriarch of a sporting family who subsequently became synonymous with Swansea sport, as three generations of the family played with distinction for the town club, and the early county sides. Born in Cambridgeshire, Bancroft had worked as a bootmaker in Bury St. Edmunds and London, before moving to Swansea in the 1850s after accepting a position as the professional for the town’s cricket club. It proved to be a highly beneficial move as Bancroft enjoyed great success as an all-rounder and, with the town’s young sportsmen also playing rugby, his bootmaking business also secured plenty of trade during both the summer and winter months. Bancroft also played for the Glamorganshire and South Wales sides, and becoming a highly trusted friend of J.T.D. Llewelyn with William’s son subsequently becoming employed by Llewelyn as his private cricket coach. More work also came the way of the Bancroft following the acquisition of St. Helen’s, with the popular professional carefully overseeing the creation of the new wicket. His efforts were also rewarded with the creation of a cottage built specifically for the Bancroft family adjacent to the ground, allowing William and his son to easily tend the ground as well as coach the members in the nets which were created adjacent to Gorse Lane. Through the efforts and patronage of Bancroft and Llewelyn, St. Helen’s became one of the best equipped grounds in South Wales, and an indication of this was the staging of a three-day game between a XXII of Swansea and District against a United South of England XI in May 1876, followed in 1878 by a two-day game between the South Wales Club and the Australian tourists. It also became renowned for its rugby pitch with St. Helen’s hosting in November 1881 the county match between Glamorgan and Monmouthshire, followed in December 1882 by Wales’ first-ever home rugby international against England.